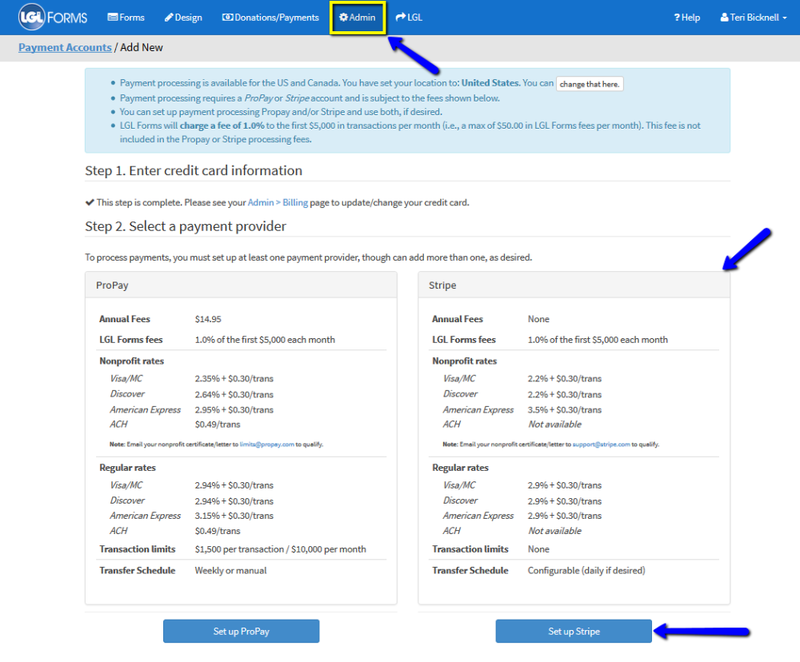 This article describes how to set up Stripe as your payment processor. LGL Forms makes it easy to create and publish online donation forms (or forms that collect payment for other reasons, such as events or membership registration or renewal). 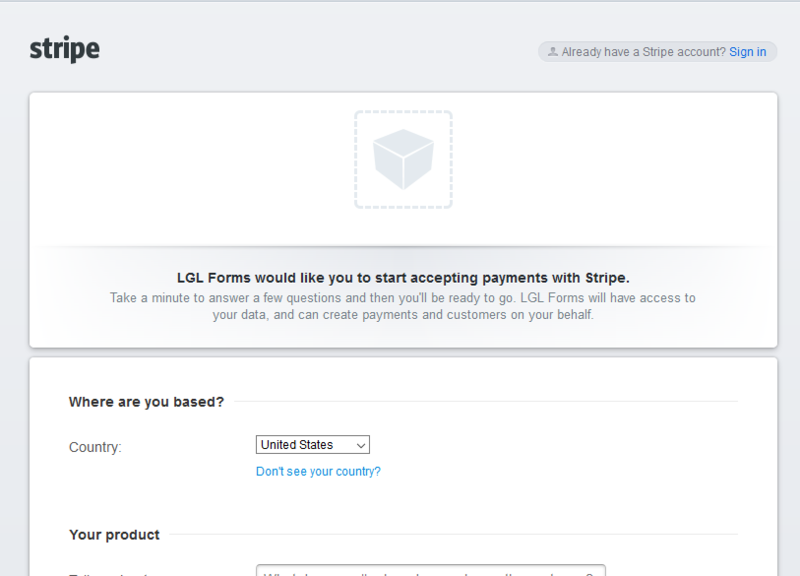 LGL Forms is integrated with Stripe, a leading merchant account provider and payment processor. First, you will need to put in a credit card so we can bill you for any transactions that are processed (1% of the transaction amount, billed retroactively on a monthly basis). Next, you'll be prompted to set up a Stripe account. Click the Set up Stripe button to proceed with setting up your Stripe account. 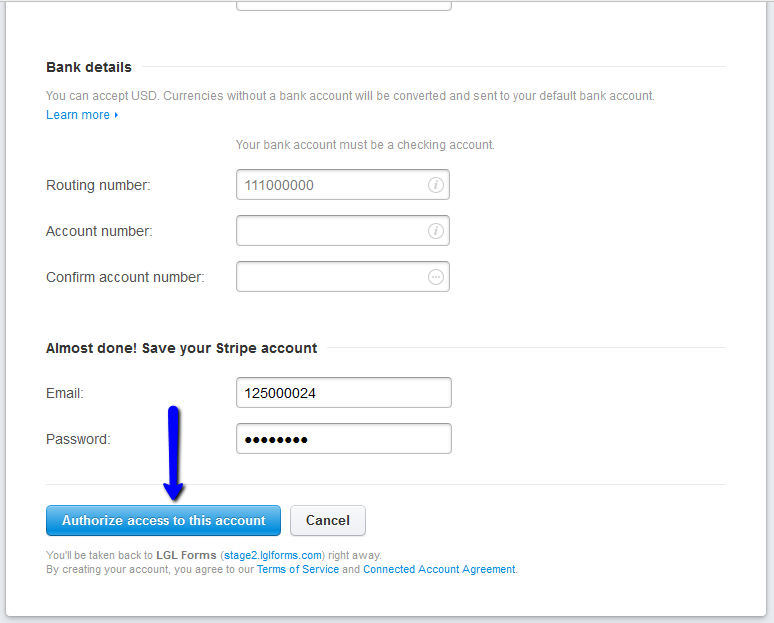 Note: As stated in the light blue text box above, if you already have a Stripe account, be aware that Stripe will automatically connect your LGL account to that existing Stripe account if you're logged into your Stripe account. That may be exactly what you want, but we've also heard from people who accidentally connected their LGL account to the wrong Stripe account (for example, if they are a consultant who works with multiple clients). Then click the Yes, connect to Stripe button and fill out the requested information in the Stripe interface. When you've populated the required fields in the form, click the Authorize access to this account button, shown above. You can now enable your LGL form to accept payments. In your LGL Forms account, you'll see a summary of each Stripe transfer to your bank account. This summary tells you about the LGL Forms transactions that are part of the transfer, but also shows the entire transferred amount. You can use the total amount transferred to reconcile transfers with your bank account statements.